The original Outlast was a huge hit thanks to its horrifying setting in a huge asylum where the inmates ran wild. In a complete contrast to the previous game’s twisting hallways and claustrophobic, cluttered rooms, Outlast 2 is set in the secluded countryside of Arizona, surrounded by woods, mountains, and farmlands. Its scores of deranged (and often naked) men chasing you down have been replaced too, this time by no less dangerous and creepy religious zealots. And it’s the change of setting that raised my own expectations of the game. Outlast was a great game on its own, but there’s no denying that the insane asylum is already a hugely familiar staple of the horror genre. 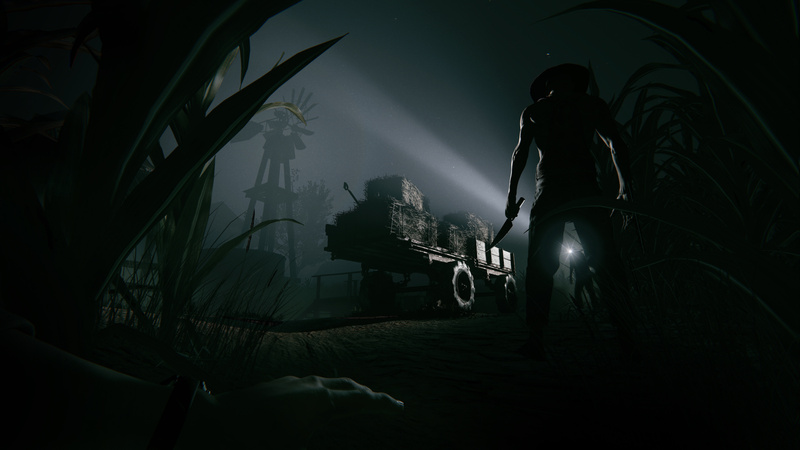 Outlast 2 on the other hand, looks to offer a more unique locale to explore with its own set of creepy sights. The image of the burning upside-down cross that’s been heavily promoted for the game sets the mood for a disturbing and uncomfortable religious undertone, and the wide open spaces now give off a huge feeling of desolation. Now I’m about to spoil the end of Outlast, so for those who care about that sort of thing, take this chance to leave. I’ll wait. Are you gone? Good, so while the previous Outlast game had you skulking around both the interior and fenced-in exterior of Mount Massive Asylum for the majority of its time, the game took a bit of a shift into sci-fi in its last act. The horrors of the mental hospital were revealed to actually be the work of a ghost-monster-thing controlled by one of the tortured patients in the labs located in the basement. For many players, it was an unnecessary and downright silly plot twist, and leaving the realistic horror of being hunted by crazed and angry men, to instead fleeing from a shadowy ghost was an unwanted change. A change Red Barrels had seemingly shied away from by instead shifting the focus to a cult-like setting in the woods, until the demo reveals that this isn’t truly the case. Though it seems the teaser for Outlast 2 was more of a compilation of settings and encounters from the upcoming title rather than a specific slice of the full game, the more fantastical elements were back in full swing almost right out of the gate. After a brief length of time exploring some run-down shacks, the demo immediately cranks up the paranormal levels as the player is pulled by a tentacle down into a well and ends up in a haunted school. Not only is it disappointing to see the disturbingly grounded premise of the religious cult done away with so quickly, but just a notch under insane asylum in overused horror locations is most definitely a haunted school. It feels dismaying to once again return to more linear hallways and lockers to hide in after being teased with the promise of more open environments, and these supernatural scares are far less interesting and unique than what was shown prior with the human enemies. Having demons and ghosts jump-scare out at the player just feels cheap and too familiar to have much of an effect anymore. What makes it all the more a shame is that the segments in the woods were actually far more effective. The first portion of the demo has the player searching through a creepy village while you can actually see other people stare out at you from the treeline, while the ending is a frantic chase through a cornfield. This is what I expected from Outlast 2 and these moments delivered exactly what I’d hoped. So why do we have to revert back to familiar territory so quickly? Despite my complaining, it’s important to remember this is only a demo and seems like a compilation of gameplay, so it’s not so obvious how the real thing will play out. Nevertheless, this more unreal horror was often viewed as a bit of a stumble in the first game, so to see it prominently displayed here is worrying. I’m still excited for Outlast 2 despite all this, but hopefully Red Barrels is able to grow from the first game and take it to some new terrifying places.